The Egyptian-European expedition discovered a huge statue of King Amenhotep III (1390-1352 BC), who was the father of the first monotheist king, Akhenaton, and grandfather of the Golden King Tutankhamun. These discoveries have been made in the middle of archaeological excavations in the mortuary temple of King Amenhotep III in Kom al Haytan in Luxor’s West Bank. The statue is carved with alabaster and shows the king sitting, wearing a royal headdress, the “nams”, and with the beard properly decorated. 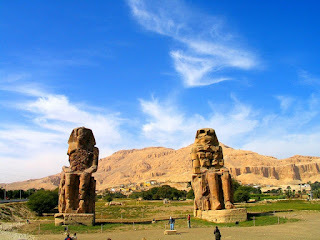 It is believed that this statue is one of two statues that were located at the entrance of the third edifice of the Amenhotep’s temple, which is located 200 meters away from the Colossi of Memnon. These two statues were thought to have been crushed during the massive earthquake that hit the country in the Roman era, and which ruined all the temples and structures with the exception of the Colossus of Memnon.